Tony and Andrea are in love and plan to marry. 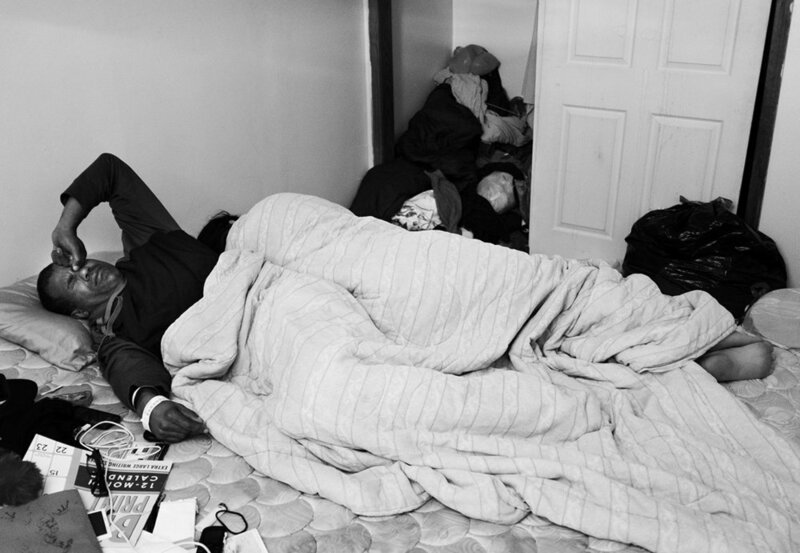 Homeless, the two moved to Quincy to live with family, but were kicked out shortly after. Taken in by friends, the couple eventually found local jobs. About a year later in the fall of 2017, they relocated to Arkansas, where Tony found work at a Tyson’s Chicken plant that pays $14 an hour. April 2017: Tony, 44, walks 10 blocks from his job at Pizza Hut to his home. After getting rent money from the General Assistance Program, he found a job at Pizza Hut where he made Employee of the Month. Tony had open heart surgery when he was 2. His dad died when Tony was 18, and his mother died when he was 30. He spent time in the penitentiary when he was 36, and when he left, he was homeless. 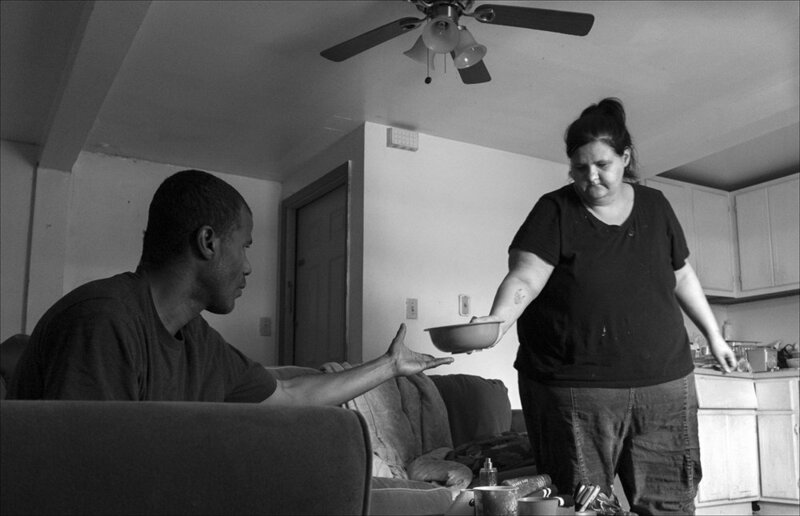 Tony and his girlfriend Andrea often take in the homeless off the street, sharing what little they have to offer. April 2017: Exhausted from working extra hours and not sleeping well the night before, Tony is comforted by his girlfriend Andrea. Tony is admitted to Blessing Hospital later that day for dehydration and low blood pressure. Tony has been working as many hours as he can get, often filling in for others, so he can save enough money so he and Andrea can move to a better apartment. April 2017: Returning home from work, Tony is greeted with a bowl of soup for dinner. He talks about the help he’s received by organizations in Quincy. “I was working with General Assistance,” he said. “They helped me pay part of my rent. I was going around picking up the community. I like to help the community out, because there's a lot of trash on the road where kids don't need to be picking up needles and all that drug paraphernalia and all that stuff. They don't need to be picking that up and hurting themselves." “Here in Quincy, I think the soup kitchen, it's gonna be booming real good, because they help people with food. There's another couple organizations around here, they help you with bills, and they help you with getting jobs. I think Quincy is a pretty good town because they try to help people -- good church-going people. And I'm glad I did move here so I can get some help." 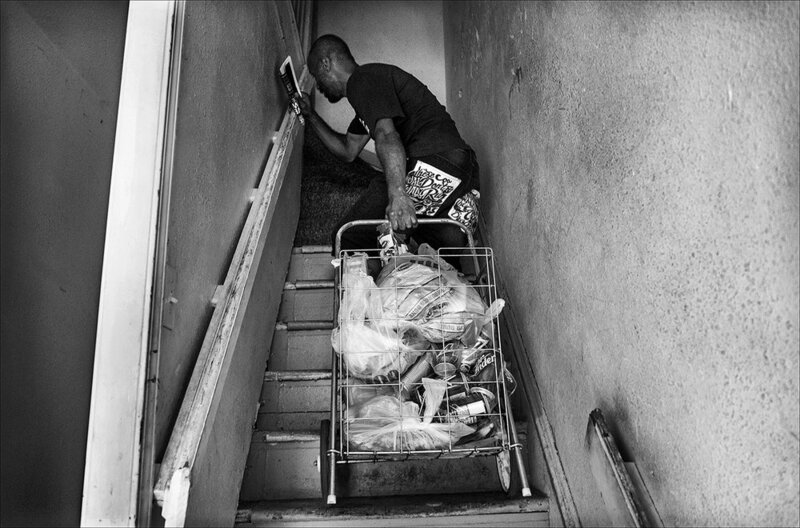 August 2017: Walking home from the Horizons Food Pantry, Tony pulls a cart of food up the stairs to his apartment. Tony says it took him about six months to get all of his paperwork in order to find a job. He needed a new driver’s license, Social Security card and birth certificate.